Jimmie George Roberts, Sr. age 87 of Madison passed away on May 16, 2017 at Skyline Medical Center. Mr. Roberts was born on June 16, 1929 in Memphis, Tennessee to his late parents. He enjoyed hunting, fishing, playing Church and Open League Softball at Shelby Park and coaching his daughter softball team. 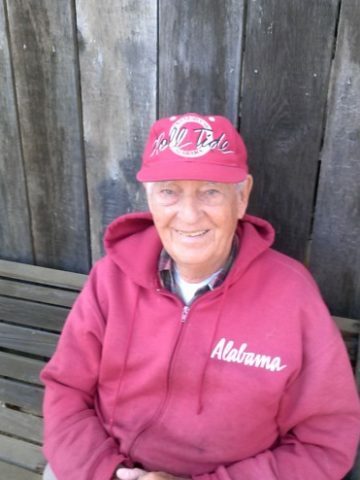 He was a proud and hardworking man, providing for his family and a true Alabama Fan “Roll Tide”. A favorite memory that was shared what growing up on Sunday afternoon; Mr. Roberts would make homemade ice cream, everything from traditional vanilla, snickers, chocolate and a kind just like Wendy’s Frosty. He made special time for each of the kids, making sure each child got time with him doing things they loved. There wasn’t a day that went by that Mr. Roberts didn’t look at his beloved wife and let her know how much he loved her. He will forever be known as a loving husband, devoted father, proud grandfather and cherished great-grandfather. In addition to his parents, Mr. Roberts is preceded in death by his brother, Donald Roberts. He is survived by his adoring wife of 66 years, Amazona Christeen Roberts; children, Jimmie (Carol) Roberts, Jr., Deletha Crane and Eric (Tammy) Roberts; grandchildren, Chris (Rhonda) Roberts, Jeff (Carrie) Roberts, Adam (Holley) Roberts, Jonathan (Leigh) Crane, Cody (Rheanne) Roberts, and Caleb (Dario) Roberts; great-grandchildren, Jessica Roberts, Daniel Roberts, Thomas Roberts, Alex Roberts, Addison Roberts, Avery Roberts, and Cade Roberts and siblings, Barbara Ann Jones, Elizabeth Shelton, and Roberts Allen Roberts. A Graveside Service will be held on Saturday, May 20, 2017 at 1pm at the Glendale Cemetery in Leighton Alabama. Funeral Services will be held on Friday, May 19th at 7pm in the Cole and Garrett Chapel in Goodlettsville, with visitation with the family from 4:00pm until the time of service. 3 Comments to Mr. Jimmie George Roberts, Sr. Please accept our condolences for mr. Roberts. Uncle Jimmy will be sorely missed. He was the eldest son of the late Mr. John William Roberts and the late Annie Ozella McGeHee Roberts. He was loved and respected by all of his siblings. Aunt Amazona and the rest of the family our thoughts and prayers are with you all.